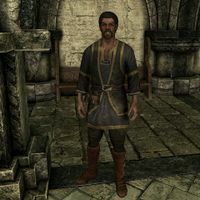 Razelan is a somewhat drunk Redguard merchant who can only be found in the Thalmor Embassy during Diplomatic Immunity. He arrives at the Thalmor Embassy at the same time as you and doesn't enter the building until you've presented the guard with your invitation. If plied with enough alcohol, he will provide a distraction for you. If any of the other guests (other than Erikur) are made to provide the distraction, they will start a heated conversation with Razelan, which will cause a commotion. Razelan wears a set of merchant clothes along with a pair of boots. During the party at the Thalmor Embassy, if Maven Black-Briar is in attendance and one is on friendly terms with her, she will reveal with disgust that Razelan is a member of the East Empire Company. This page was last modified on 13 August 2017, at 01:49.